Over the past several years, motorization has evolved into a standard rather than a luxury for all kinds of motorized window coverings. Motorization can solve the most demanding shading challenges. 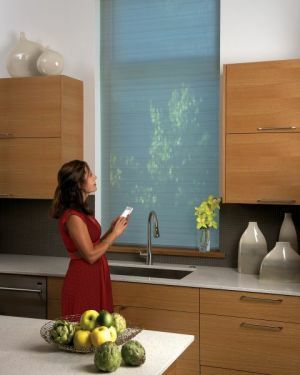 Motorization is ideal for large or hard to reach window coverings. Motorized window treatments controlled by a remote or switch provide unrivaled convenience and ease of operation. 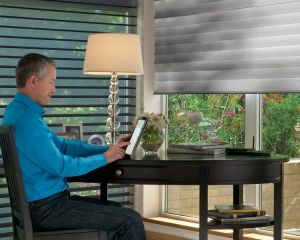 Almost any shade can be motorized with a high quality motorization system that operates at the touch of a button. As an authorized dealer, and certified installer we feature the following top quality shade and drapery motor manufacturers: Lutron Electronics, MechoShade and Somfy. Lutron Electronics has been around since 1961, after releasing a product that was revolutionary at the time, a dimmer switch. Now Lutron is know worldwide for excellence in all aspects of light control and has gained ground as a favorite option for motorized shading systems. Lutron motorized systems can be used for roman shades, roller shades, and drapery tracks. Lutron offers a wide variety of fabrics for any application, whether you reqiuire privacy, blackout, or sheer window coverings. In 1969 MechoShade then known as HomeCraft developed a "flat drapery" with an operating system that rolled up the shade with a looped bead chain. The Fabric had to be custom sized to the correct width to operate properly with a single thickness of fabric. The result was a most successful project, and creation of the original manual roller shade system. MechoShade went on to develop a new solar protection shade system that was presented to the New York Architects and subsequently was awarded a major project, the Irving Trust Co. at One Wall Street. The entire building was retrofitted with this new shading system, which was named MechoShade®. In the thirty years since, MechoShade Systems , Inc. continues to be a pioneer in the development of solar shading, creating solutions to brightness, glare and solar control problems. Through the research and engineering capabilities that created the MechoShade system in the beginning, MechoShade has become the only single source solar shading designer and manufacture of hardware, shadecloth and accessories. MechoShade is in the forefront of energy efficient solar shading design at the window wall to achieve personal, thermal, and visual comfort in conjunction with the more efficient use of natural resources. It is this reason why you find MechoShades in many “Green” projects, including those that have achieved LEED™ certification. Somfy has developed into the world leader in motors and control systems for the automatic movement of products around the home and workplace. Somfy is the world’s leading manufacturer of specilized motors and control systems for retractable awnings, rolling shutters, interior shades, blinds, projection screens and other lift-up applications for the home. For more than three decades engineers at Somfy have been designing quality products that bring your home to life…Products that put interior and exterior window coverings in motion at the touch of a button…Products that make life easier and more enjoyable. Home Motion brings your home to life by creating movement for all openings to help you save energy and add comfort to your daily life.